I’m up before 6 am, edgy to make sure we leave on time. On the drive down to Harwichport, I feel the way I did when I was six and knew I had to get a shot at the doctor’s office. Slightly nauseous and full of dread. It takes about 90 minutes to get out there and we are going 35 knots an hour so we’re pretty far out. Once we stop, it’s 240 feet deep with no land in sight. The captain dumps 4 pounds of Menhaden chum into a thick mesh bag tied to a cleat and throws the bag over the side. He then drives in a circle about 800 yards in diameter dragging the chum and stops at a point where we’ll drift down into the circle. He shuts off the motor, lowers the cage into the water and starts putting bait on the line. And by ‘bait,’ I don’t mean worms. These are fish heads and carcasses that are two to three feet long. He has two lines, each with a small round orange buoy on top. Someone asks why the buoys are orange. 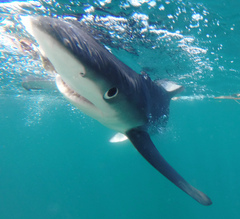 The captain says he took a group of researchers out to study the effects of color on sharks. They tried blue, green, red, yellow and orange. 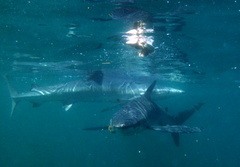 The sharks were most attracted to orange. “That’s interesting,” I comment. 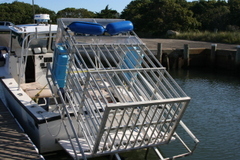 He looks at me and grins, “What color are the life saving devices on your boat?” Oh. Gulp. He says it’s a $10K custom-made aluminum cage that holds two people. It has four sides and a bottom, which makes me wonder what happens if a shark jumps in the cage with one of us. He makes a point of saying this is an open-water shark dive and not a reef dive like in FL “where the sharks are like pets and know they’ll be fed.” He says he never knows what will show up. After 10 minutes, we see one of the buoys disappear in the water. “They’re here,” he says. Jessica starts pulling on her wetsuit. The rest of us are a bit slower. It’s cold and I’m not sure I want to get in for just one shark. Actually, I’m not sure I want to get in at all. Before anyone enters the cage, the captain gives us a speech about safety and where the steps in the cage are (“people tend to forget where they are when they get scared and want to get back in the boat quickly.” Very comforting). “Don’t do anything stupid,” he says, “like try to pet a shark’s tail. They can bend 180 degrees in a second and will bite your arm off before you know what’s happened.” He goes on to say that the nearest hospital is 40 miles away and that “duct taping your stump is the best I can do.” Fine by me – I have no plans to get cozy with them. When three or four of the sharks come swimming around, I start to get ready. The captain has snorkeling gear but advises just using a mask or we’ll end up choking on sea water and freaking ourselves out. I step out on the swim platform and stand on the edge of the cage. It jerks with the waves and I have to hold on. I turn around, lower myself down, and yell when the 58-degree water enters my wetsuit. It’s freezing. I pull down my face mask and prepare to go under for the first time. I take a deep breath, plunge under and come up spluttering. This is crazy, I think. What the hell am I doing? Forget the boat trip. THIS is the stupidest thing I’ve ever done. I take a few deep breaths and go under again, a bit more calmly. It feels surreal when the first shark passes by. It is the feeling of being completely out of one’s element, which I am – literally. No gills on this body. 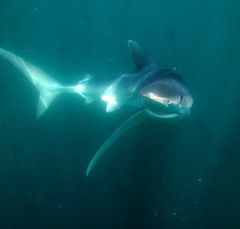 I’m suddenly deliriously happy that the captain has said we have very little chance of seeing Great Whites. He has the habit of referring to them as “Fluffy” (as in “when Fluffy comes around, all other sharks disappear”). I think Great Whites are a bit more than I could handle at the moment. I come up when I run out of air and take another deep breath. After a while I get the hang of it. 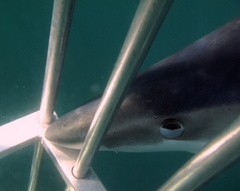 The tricky part is the buoyancy – I have to wedge myself down in the cage so I can look around and don’t float back up. The first time I do this, I hook my feet on the vertical metal bars behind me. I stop doing this when I look behind me and realize a shark is there, possibly assessing the snack potential of my feet. Instead, I hook my heels inside the cage under the steps to stay down (the captain says weight belts would just scare people). One of the sharks passes within inches of my face. I look into its eye – there is nothing human there. No sign of compassion. Just a cold, blank stare. After everyone has been in the cage once or twice and feels comfortable, the captain starts putting the bait closer and closer to us. 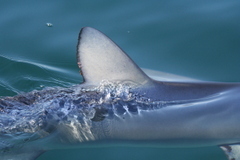 Sharks have something called a nictitating eye membrane. It’s like an extra eyelid that protects their eye when they go postal on their prey. The result is that it looks like their eyes roll back in their head when they attack the bait (as if they don’t look maniacal and insane enough up close). Here are some things I learned about sharks. They are actually rather timid. 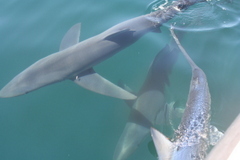 It takes a lot of time (and bait) to get them close and comfortable enough to swim around the boat freely. This is comforting. 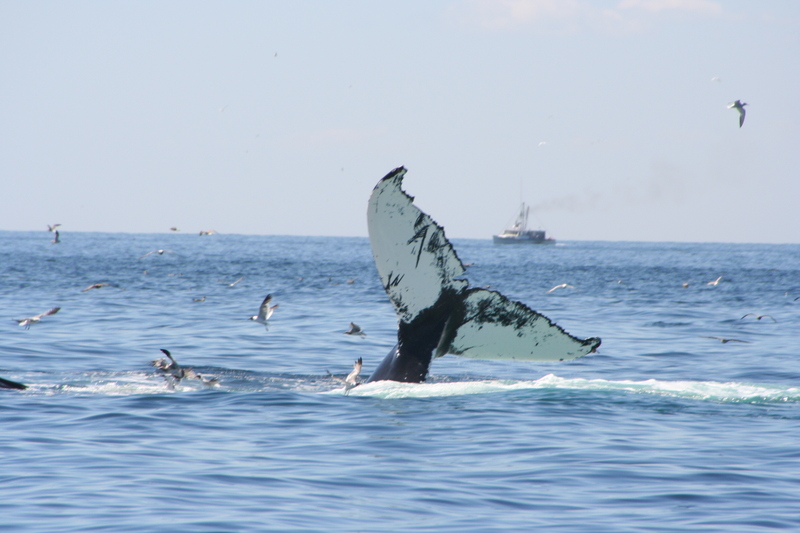 Another misperception is that they swim on top of the water and that you can see their dorsal fin as they approach. This is not the case. They’re usually well below the water line. Not so comforting. 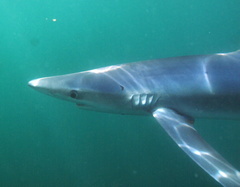 These are blue sharks and are truly beautiful creatures, purplish and indigo in color. 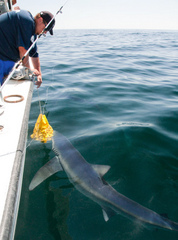 The captain estimates the largest to be 10 feet long and about 270 pounds. There are 6-8 of them swimming around. This surpasses all expectations. And then the whales show up. I’m warming up on the swim platform when I first hear them exhaling through their blowholes. I look up. There are 4-6 Humpback whales swimming a few hundred yards away. They are feeding. They breach and then come up with their mouths open and dive under again. It’s that classic whale tale shot. Everyone is grabbing frantically for their cameras. Jessica and I ask if we can climb around the windshield onto the bow. It’s only an 8-inch ledge and 6-8 sharks are circling five feet below us. “Just don’t fall in,” the captain says. We sit up there and take photos of the whales. The only sounds are the non-stop clicking of our cameras and the whales breathing. A Minke whale passes by on the other side. I’m sitting on the bow in my wetsuit being warmed by the sun and alternating between watching the whales and watching the sharks below. This is my life, I think. This is my life at this moment. I have to stop to just breathe it in. Jessica and I look at each other with a “Can you believe this is happening?” look. Laughing, the captain says that he orchestrated the whole show just for us. Off and on over the past few years, I would have the sense of having lost part of myself. I think it happens after years of marriage and raising children and making a living. Years of putting others’ needs before your own. One day you find yourself on the back burner and realize you’ve been there for years. I would occasionally wonder what happened to the wild spirit who traveled the world, who spent two years volunteering in the Dominican Republic, who skydived and went scuba diving. I’d sometimes think Where did she go? Today I thought Oh, here she is. I would do it again in a heartbeat. This entry was posted in Uncategorized on August 31, 2014 by Diane.